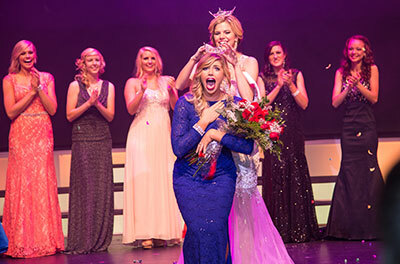 Dixie State University student Sara Wulfenstein was crowned the 2015 Miss Dixie Homecoming Queen in front of a near-capacity crowd Tuesday night at the university's M.K. Cox Performing Arts Center. The pageant was held as part of the university's annual Homecoming Week festivities, which will continue through Saturday. Wulfenstein, who is from Pahrump, Nev., won a full-tuition scholarship and the opportunity to represent Dixie State at the 2016 Miss Utah Pageant next June and compete for a chance to advance to the 2017 Miss America Pageant. Pageant hopefuls were judged in physical fitness/swimwear, eveningwear and talent along with the customary onstage question and personal interview portions of the event. For the talent portion of the competition, Wulfenstein performed a hip-hop dance to Dillon Fancis' "Get Low." Her platform, which she presented about to judges prior to Tuesday evening's event, is "College Bound." Rounding out the 2015 Dixie State Homecoming Royalty are First Attendant Sarah Nilsson, who is from Centerfield, Second Attendant Sahalie Cindrich, who is from American Fork, Third Attendant Shellie Stirland, who is from Hurricane, and Fourth Attendant Beka Amodt, who is from Virgin. Four additional awards were presented at the pageant. Amodt was presented the Director's Award, Nilsson was honored with the Community Service Award, Stirland garnered Miss Photogenic honors, and Wulfenstein was named Miss Dixie Spirit. Dixie State University's 2015 Homecoming Week concludes Saturday with the annual Homecoming Parade, in which Wulfenstein and her attendants will participate. Line Tabernacle Street from 700 East to Main Street at 10 a.m. to enjoy the floats, bands and giveaways. Immediately following the parade, the Founders' Day Assembly and Hall of Fame Induction Ceremony will be held in the St. George Tabernacle at 11:30 a.m.
Later in the day, the Dixie State Alumni Association will host a free tailgate party that will serve grilled hamburgers and hotdogs and offer bounce houses and prize drawings. The fun will start at 3:45 p.m. in front of the Wade Alumni house, 684 E. 500 South. Walk across the street at 6 p.m. to cheer on Dixie State's football team as they take on Azusa Pacific. For more information about Dixie State University's Homecoming 2015 week, visit Dixie.edu/homecoming.